I never thought a film with at least two guns present in every frame could be so…quaint. I would use a stronger word in place of quaint, like boring, dull, drab, lackluster, or lifeless, but I’ll admit that despite its ‘quaintness,’ Appaloosa isn’t an entirely wasted effort. The film centers on lawman Virgil Cole (Ed Harris) and his sidekick Everett Hitch (Viggo Mortensen), who are hired to defend a Western city, Appaloosa, from villain Randall Bragg (Jeremy Irons). Renee Zellweger shows up as a widow who steals Virgil’s heart named Allie French. The cast assembled here is certainly impressive, but they all seem rather bored in their roles. Jeremy Irons has never been less menacing then he is here, and considering that the entire plot of the movie hinges on how effective a villain he is, that’s definitely a problem. Bragg never seems like a threat to the town or to the main characters, and any time spent pursuing the man feels empty and worthless. Mortensen and Harris have a definite chemistry, and the best moments come from interaction between the two leads. Still, every moment they share together reminded me of their relationship in A History Of Violence, an excellent film where Harris played the villain. I realized early on that watching the two as adversaries is more interesting then watching them as friends, though the lack of any strong antagonist in the film doesn’t help. Actually, my mind wandered off to other, better films quite frequently while watching Appaloosa. A scene where Virgil and Everett transport Bragg to prison, along with countless other scenes, made me long to watch last year’s outstanding 3:10 To Yuma. Hearing Jeremy Iron’s Western accent made me think of the scene in Die Hard With a Vengeance where he tricks the security guard by talking ‘American.’ Any scene where Mortensen got to show off his considerable acting chops (like the ending) made me excited to see his performance in the upcoming The Road adaptation. That’s not to say the film is necessarily derivative; it simply shows that the film lets your mind wander. 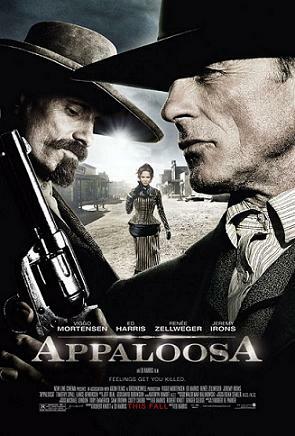 Appaloosa’s boring storyline, poor pacing, and rather lifeless characters make for a movie that I wouldn’t call instantly forgettable, but concurrently forgettable. If you aren’t paying rigid attention, your mind will wander (often to other projects the cast was involved with, as shown above) and you’ll forget what you’re watching. The dialogue doesn’t help; many of the lines seem pulled from a book, which isn’t unlikely considering that a novel is the source material for the film. The problem is, book dialogue is not film dialogue. There’s a difference. Some lines can work when reading them in an armchair, and some lines are cringe-worthy when watching them performed. Stilted is probably the best word to describe much of the dialogue, and the narrations by Viggo Mortensen that bookend the film are just awful. Still, the script gets creative with its dialogue once in a while, resulting in some funny or insightful phrases. Despite my bashing, the film isn’t horrible; it’s just terrifyingly mediocre. Still, it often touches upon moments of something fun and exciting. There’s some witty banter between the two leads that is very funny, and when the film does build momentum, it can be genuinely exciting. Ultimately though, the film ends up feeling like a love story more than an action film, and the love story is bland, due in no small part to a poor performance by Zellweger. My favorite part of the film was the immensely satisfying ending, which felt like the end of something much, much better. Mortensen really gets to do some nice acting in this scene, as does Irons. Ultimately though, one scene at the end of the film doesn’t redeem the other two hours of snooze-fest. The most memorable element of the film is Mortensen’s epic facial-hair, which is the current front-runner for Best Moustache at this year’s Oscars.